About two months after the death of Rezo, Lina and Gourry found out that they and Zelgadiss had large bounties on their heads. The client was Rezo the Red Priest and he stayed in Sairaag, and so the two headed there. On their way to Sailaag, Vrumugun appeared with Dilgear and Rahanim, a fishman. Lina killed Vrumugun and injured Dilgear, but Rahanim attacked with excellent speed. Lina and Gourry fled from the fishman. They met up with Lantz and went together to Sailaag. They arrived at the Forest of Evil Aura (shouki), on the edge of Sairaag. In the forest, they met a young girl, Eris, the bounty hunter. She said that Zelgadiss tried to kill Rezo but failed and he ran away with Sylpheel, the daughter of the chief priest of Sairaag. Lina begun to search for him, but then Vrumugun attacked again. The sorcerer brought Vizear, Bardz, Gorus, Rahanim and many lesser demons. Lina killed Vrumugun again, and Zelgadiss arrived with Sylpheel. She was a maiden in the service of the shrine of Sairaag. Lina and her comrades killed almost all of the lesser demons, leaving only Vizear, Rahanim and one lesser demon. Then, Rezo the Red Priest intervened. He defended against all of Lina's and Zelgadiss' spells, and struck back with a strengthened Mega Brand (which explodes the ground and blows away everything on it). Lina, Zelgadiss and Sylpheel made a big barrier with the spell Windy Shield, and Lina tried to flee inside it. Rezo finished casting his spell before Lina did, but he didn't attack until she and her allies rose high enough as to be safe. Sylpheel guided them into the huge tree, Flagoon (the Holy Tree). It stood in the center of Sairaag. Lina and Zelgadiss talked about Vrumugun. He said that he had heard that name from Rezo, but he had not met Vrumugun before the death of the Red Priest. He had been attacked by Vrumugun for five or six times, and each time he killed Vrumugun. Lina came to the conclusion that the real Vrumugun had not appeared yet. The real sorcerer controlled a man with a ruby on the forehead. Lina recalled the red jewel on the forehead of the new Rezo. Sylpheel said there was a magical sword called the Bless Blade. It was resonant with Flagoon, and it could convey the will of the person who had the sword. Sylpheel and Gourry went away to get it, while Lina, Lantz, and Eris went mushroom gathering. Suddenly Lantz and Eris attacked Lina. She found a ruby on the forehead of each of them, but it was too late. She was badly injured. Zelgadiss arrived in time, and he knocked out Lantz and Eris. Sylpheel and Gourry came back, and Sylpheel used the most effective healing spell, Resurrection, to cure Lina. Lina wondered why Vrumugun didn't stop Zel, and she began to suspect Eris. Before Lina was recovered enough, Rezo found out where they were, and Gourry and Zel went outside of Flagoon in order to buy time for Lina. Vizear appeared and Lantz killed it using the Bless Blade. Outside of Flagoon, Lina revealed that Eris was the real Vrumugun and that she controlled the copy of Rezo. Eris said she wanted to kill Lina, Gourry and Zelgadis for her love for the late Rezo. But the copy of Rezo showed he had his own identity and how he hated the original Rezo, killing Eris. He wanted to fight and defeat Lina and her friends in order to surpass the original Rezo. He destroyed the city of Sairaag to make a suitable battlefield. 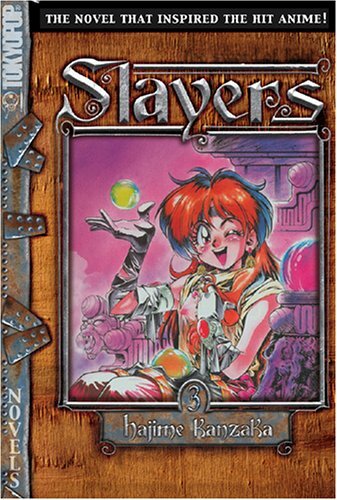 Lina took the Bless Blade, and impaled the copy of Rezo onto Flagoon. Sylpheel used the healing spell Recovery on the Holy Tree and Flagoon ate up all of the copy of Rezo's energy. The copy of Rezo died. His last words were, "let this tree be my grave marker."